Heating Oils / About | Griffin Oil and Propane | Suffok Energies, Inc.
Today’s oil heat is one of the safest, most efficient ways to heat a home or business. Fuel Oil is a very stable, combustible, non-explosive product, which addresses some of the safety concerns that surround other fuels. New heating oil systems and technology make it one of the best ways to ensure warmth, reliability, and comfort. Efficiency: Modern Oil heat systems now boast efficiency ratings of 95 percent, providing more warmth with less fuel than ever before. Another component of its efficiency is the high BTU content found in a gallon of oil, versus an equal measure of natural gas, propane, or electricity. Clean and Safe: Today’s Oil heat is 95% cleaner than it was in 1970. Modern Oil heat systems create absolutely no soot, dirt, or odors in the home. Oil heat is as environmentally friendly as gas and non-explosive. In fact, unlike other heating sources which can burst into flames, Oil heat cannot burn in a liquid state. Abundant: There’s an abundant – and safe – supply of Oil heat to keep all of America warm and comfortable for many years to come. In the United States today, 6.4 million households use Oil heat. 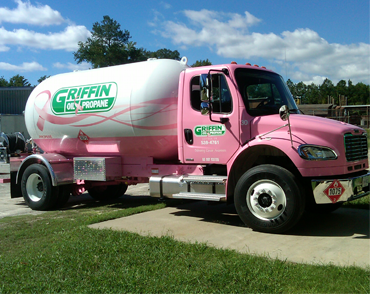 Griffin Oil & Propane has a staff of qualified technicians to handle any of the heating oil service needs of our customers. Our Annual Oil Heating Service Agreement includes an essential 15-point clean and safety check and is an excellent way to keep your system running smoothly. Routine system maintenance helps reduce your fuel bills, assure maximum safety, prolong equipment life, and helps control unplanned expenses.